Crispy, delicious Crab Cakes plus a video with step-by-step instructions showing you how to make this easy, delicious meal. Today, it’s all about crispy and delicious Crab Cakes – and I’m delighted to pass the story telling reins over to my husband Jack. Jack also made a video to show you step-by-step how these crab cakes are made – scroll down to the recipe card below see it! When I’m not working on recipes for A Family Feast, I work full-time as a technology manager. I often take business trips to the Maryland area – home of some mighty delicious crab cakes – to meet with my boss and other technology managers. A few of my Maryland-based colleagues are chow hounds for homemade crab cakes. Of course, neither of them will share their secret recipes (Troy and Bob, I’m talking about YOU!). 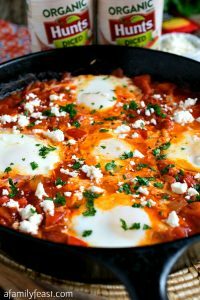 So instead, I had to go about developing this recipe alone – but I think I did a pretty good job if I say so myself. 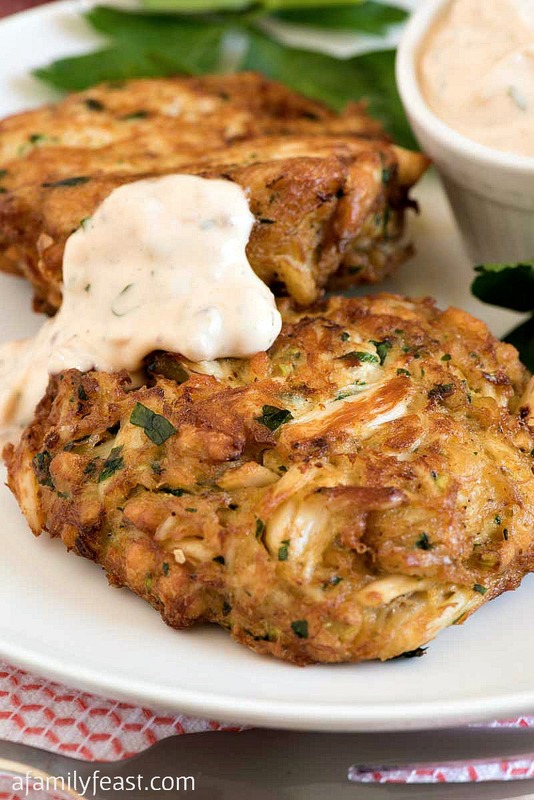 These Crab Cakes cook up crispy and golden brown on the outside, and moist on the inside. What kind of crab meat should I buy for Crab Cakes? One tip Troy and Bob did share with me is that there are different grades of crab meat. They explained that the term “lump” used to mean large claw meat but somehow it now means shredded crab meat. To get large pieces of crab for your crab cakes, you must buy crab meat packages marked as ‘jumbo lump’ or ‘petite jumbo lump’. Another tip is to buy refrigerated, pasteurized crab meat – which has been heated to kill bacteria and the process extends the shelf life of your crab. Fresh crab meat can also be used but it is highly perishable so you have to cook with it almost immediately. (Troy and Bob do not recommend canned crab meat.) Phillips and Chicken of the Sea are two pasteurized crab meat brands – they can be found at some Costco, BJs Wholesale, and Walmart locations. We found that during my experiments in the kitchen, jumbo lump by itself did not hold together well when I cooked the crab cakes, so (as you may have noticed in the video below) I mixed both lump and jumbo lump crab meat together, along with the other ingredients. The shredded pieces of lump helped hold the crab cakes together but there were still large claw pieces when you bit into the crab cake. Can I prepare Crab Cakes ahead of time? 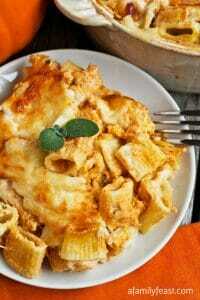 Assuming you are making this recipe with pasteurized crab meat – absolutely! 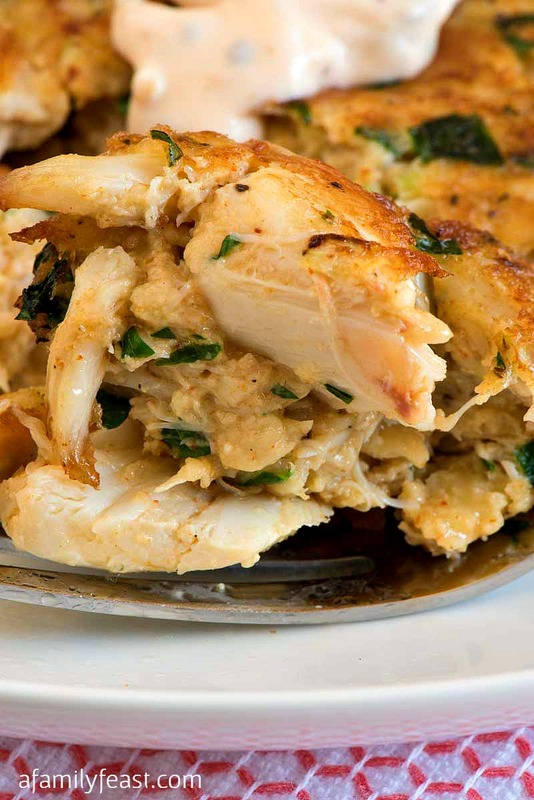 You can mix up the crab and other ingredients, then form them into cakes and lay flat on a parchment-lined sheet pan. Store in the refrigerator for about a day before frying. Or, you can freeze them uncooked. Place the sheet plan in the freezer for about two to three hours, or until the crab cakes are firm. Once they are firm, wrap the crab cakes tightly with plastic wrap and store in the freezer for up to one month. Defrost in the refrigerator before cooking. What can I serve with Crab Cakes? Other delicious menu ideas include this fantastic Potato Salad, Coleslaw, or Lobster Corn Chowder. Serve this amazing Sweet Corn Gelato for dessert! To make the red relish spread, mix all ingredients in a small bowl and refrigerate. To make crab cakes, in a medium to large bowl, mix celery, onion, parsley, mustard, mayonnaise, Worcestershire sauce, eggs, cayenne, salt and Old Bay. Mix to combine. Add cracker crumbs and both crab types and gently fold to combine. Using an ice cream scoop or a half cup measure, scoop out 12 cakes onto a parchment or foil lined sheet tray. Then roll each and flatten into a 3 ½ inch round thick disc. Place back on the tray and refrigerate for at least 30 minutes to set. When ready to cook, heat oil in large skillet to 350 degrees F.
With two spatulas, gently slide each one into the hot oil, cooking in two batches, six per batch. Cook for about four minutes to brown. Lift one up at three minutes to check underside for color. Using two spatulas again, gently, flip onto the waiting second spatula and slip back into the hot fat. Do it this way so they do not splatter oil when turned. Remove to paper towels and once the oil is back up to temperature, cook the second batch. Serve with the prepared sauce. 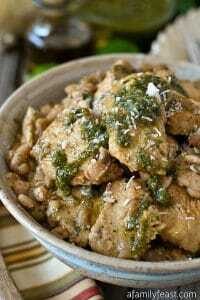 We used fresh hand-picked lump gram meat, and they came out great. All of our effort paid off when we bit into the bun. A good tartar sauce and the Old Bay make it! This is excellent I am a foodie and gourmet chef and when I am “cowboying” it I will add a variety of things at home for a quck snack – often will make a fish cake from a whole pepper-onion- rosemary stuffed sea bass grilled and smoked over cherry wood – leftover grilled shrimp and snow crab legs – all “fresh” leftovers and cakes that may be frozen for that, which is my ultimate crab cake goal:, favorite Sunday brunch, Eggs Chesapeake. They turn out well. However, as foodie purist who only feeds me – for me to buy $70 worth of jumbo lump crab meat and knowing that crab meat – so complex yet simple and luscious – needs to stand alone, not compete – as all exquisite seafood should – play second to none, and that which does must be it’s equal delish. Finely ground breadcrumbs? about 2 TBS – no more than 3. I was decadent also here: two day old black olive, rosemary whole wheat foccacia – very complementary flavors whispered. One egg yolk. Done. So I patterned this from Big Fish in Crofton MD on 401. Their Sunday Brunch is worth the drive from NC.. Sounds fantastic! We may need to schedule a road trip from New England! Onions and celery and mustard and Worcestershire sauce and that much Chesapeake Bay seasoning (or any) in crab cakes? I would be run out of the state of Virginia if I made something like that. Crab is a delicately flavored shellfish. Easily overwhelmed by strong flavors. We just add enough mayo and finely crushed cracker crumbs to hold the crab cake together. We are talking a tiny bit. Don’t stir a lot so that you have large lumps of crabmeat to feast on. Don’t add Bay seasoning ever. A little shell is okay because life is hard and everyone needs the opportunity to say, “I just ran across a piece of shell.” And then cast your eyes around the table for looks of sympathy. Crab cakes are best served naked (not you, silly, you’ll detract from the perfection of the well cooked crab cake). Naked meaning no tartar sauce, cocktail,sauce, ketchup or Ranch dressing. A well made Cole slaw dripping in a mayo/sugar/apple cider dressing is expected. Troy and Bob might really be from Montana if they won’t share their recipes with you. I reckon. First, let me say that this is witty and very well written and both of us got a good laugh. Bob of “Bob & Troy” immediately sent me an email that just said “celery is blasphemy in crab cakes”. Again this is coming from a guy who brags about his recipe but keeps it to himself. 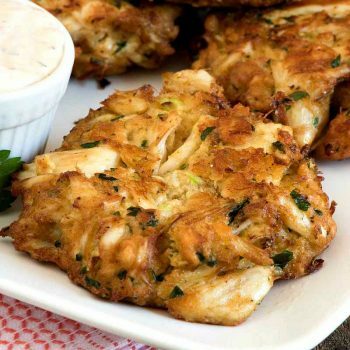 Being a New England guy, I grew up with clam chowder, fish cakes and other New England recipes but admittedly had never made crab cakes before. I looked through our cookbooks and all of them had some variation of what I ended up making. But I totally see your points on keeping it simple and letting the taste of the crab come through. I think I would like to do a crab cakes part deux, leaning more towards simplicity and maybe I can embarrass Bob or Troy into giving up their secrets. Thanks for your great response. We enjoyed it much! I’m so glad you shared your experience regarding crab cakes! I agree that they should be all about the flavor of the sweet crab meat and not distracted by a lot of herbs, etc. And I also agree that anyone who would refuse to share a recipe must’ve been so traumatized (by brutal Montana winters perhaps?) at some point in their lives that they fiercely cling to what they perceive as theirs. It’s matter of survival for them. (Whoever has all the marbles at the end of the game, wins.) So, thanks again for sharing! LOL = Thanks Nora! 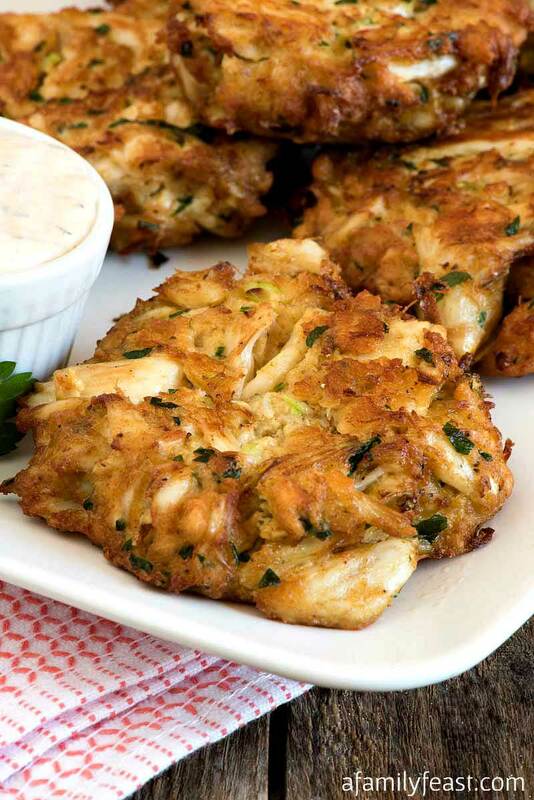 The next time we make crab cakes we will definitely try the true Maryland recipe! After a lifetime of eating crab cakes made with crab meat from the Chesapeake Bay, let me tell you to be very careful about buying pasteurized crab meat. It can be sourced literally all over the world and varies greatly in flavor from terrible and tasteless to nearly like fresh. The best pasteurized crab meat I have found comes from companies very close to the Chesapeake Bay. I would not buy it from anywhere else! Check your labels. Why spend all that money (pasteurized or fresh crab meat by the pound costs about $38 a can in Delaware and Maryland) and get something that tastes blah? Great advice Linda! Thank you! I love crab cakes and always wanted to make them. 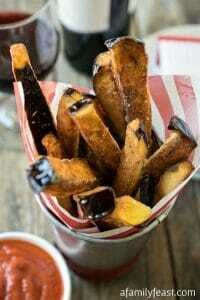 These are going on my list to make. We hope you love them Mary!